A method has been established that shows promise of being effective in removing significant masses of biofilm that encapsulate large quantities of the “cross-domain bacteria” (CDB) as they have been identified and designated by this researcher. This method applies to oral cavities only and it is simple to investigate as to its efficacy. 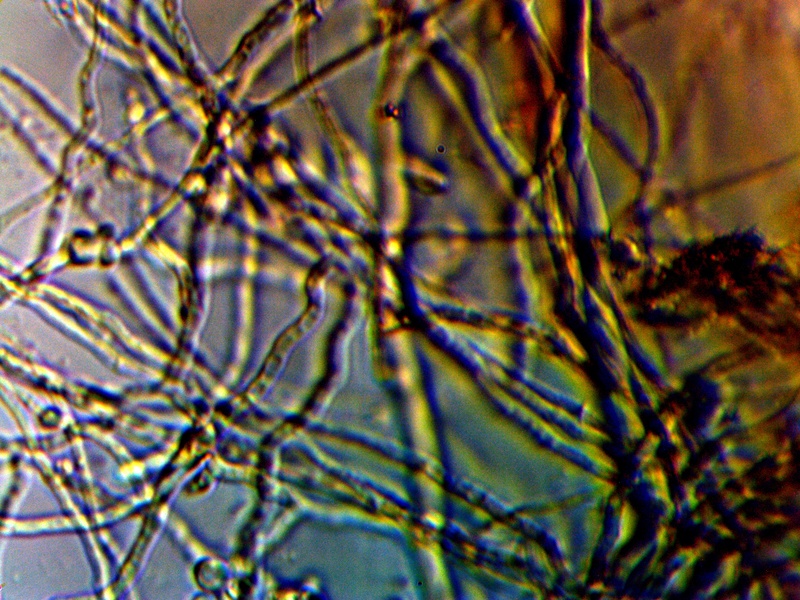 The identification of the CDB has been confirmed by microscopy; one unique feature of this organism is the frequent co-linear arrangement of the bacteria within an encasing filament. The various stages of growth of this life form have been documented extensively on this site, and a progression of development is understood. 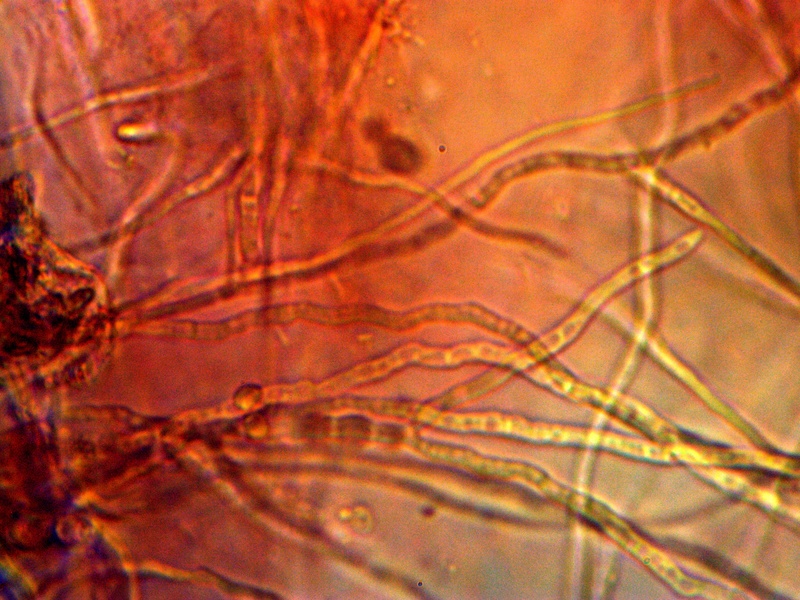 The term “Morgellons” as popularly used, is insufficient to characterize both the uniqueness of the life form and its ubiquity in the environment. The term “cross-domain bacteria” (i.e., CDB) has been established as being intrinsic to the origin of the life form; attention has been called to the the fact that the scientific nomenclature for this ‘new biology’ remains woefully inadequate. Any perception that this so-called “condition” is restricted to the human species is false; planetary consequences are before us. Please refer to earlier discussions that elevate the seriousness of this need for increased participation by the scientific and health communities. 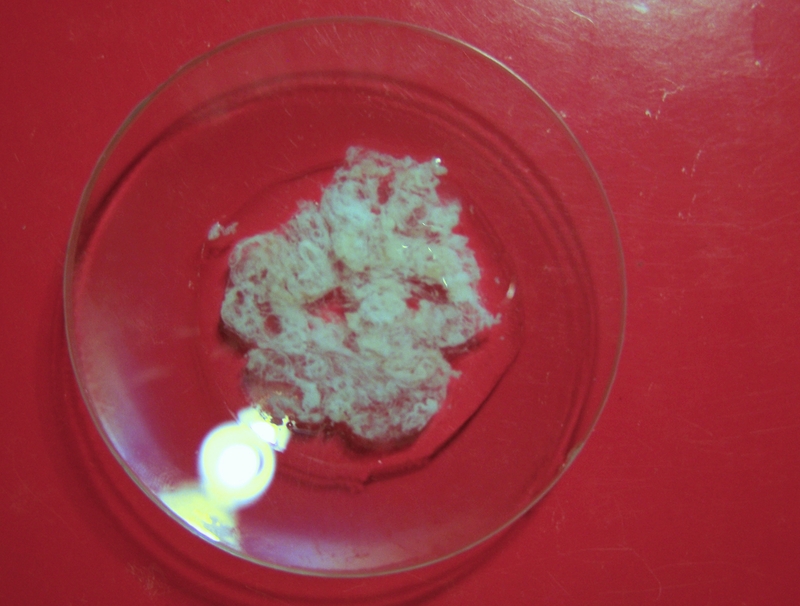 A representative example of the biofilm removed from the gum-dental line region of an individual using ascorbic acid as outlined in this report. This particular biofilm encases massive numbers of the cross-domain bacteria that are are centric to the organism’s growth and development. 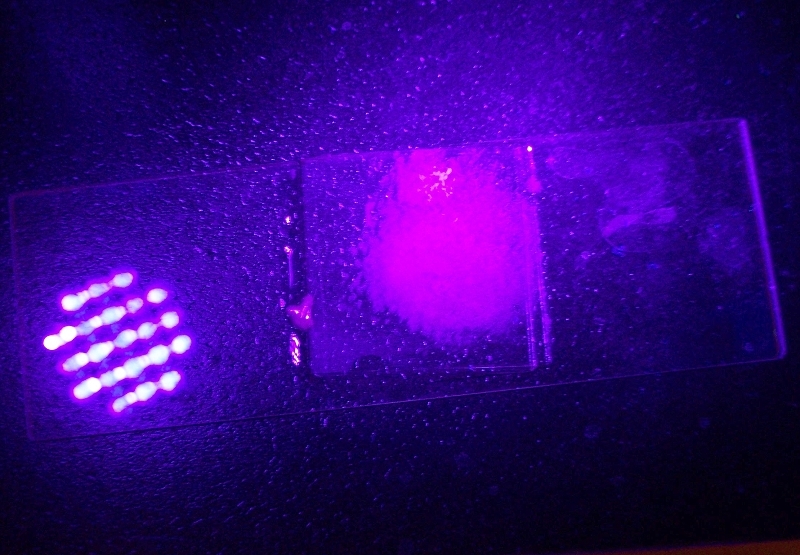 A low power observation of the biofilm sample; bottom and top lighting combined. Magnification approx. 200x. The biofilm was extracted from an oral cavity by subjecting the gum line to a fairly concentrated solution of ascorbic acid in water (approx. 1 gm. in 30 ml of water). The solution was held in place for approximately 15 minutes and the test procedure was repeated three times for an accumulation of material. There was some local tooth discomfort at the region of collection for this individual. 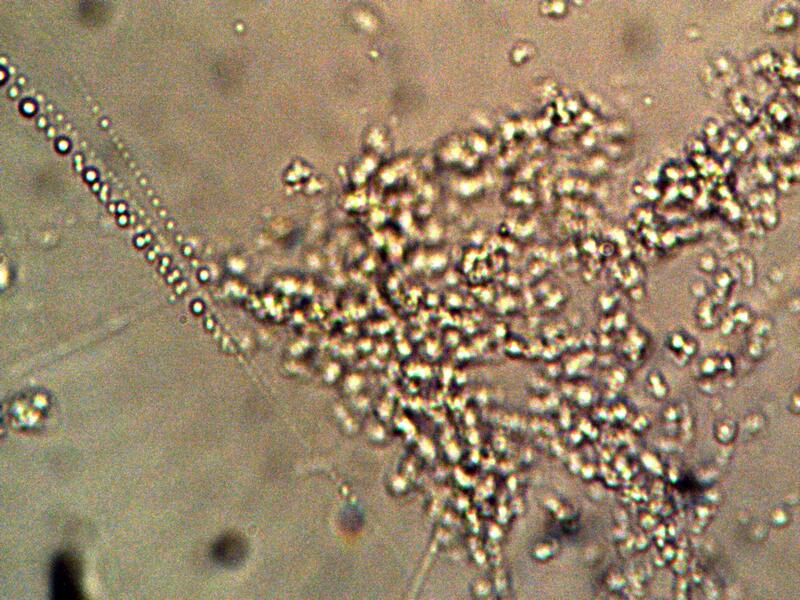 A reddish hue and formation that develops within the biofilm after approximately three days. 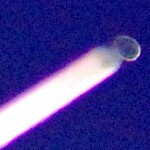 This color formation has been observed on more than one occasion and it remains to be identified. Iron complexes and hemoglobin production are topics that are under consideration; please review earlier papers that involved tests for hemoglobin within advanced cultures. Contrast on photograph has been increased to emphasize the visible color change. 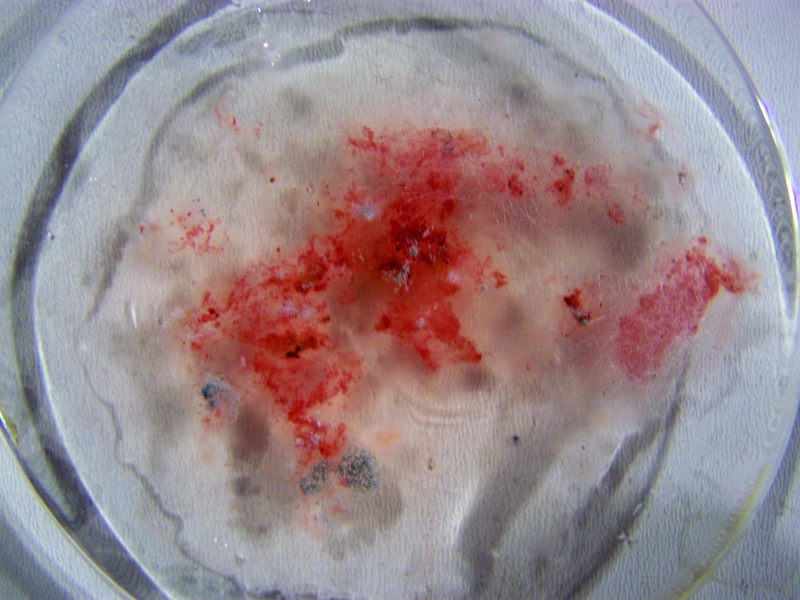 The biofilm extract after 1-2 weeks of development. Highly developed reddish color is evident. A very strong reaction of the developed red biofilm extract to a hydrogen peroxide (3%) solution. The investigation of hemoglobin existence from previous papers or current catalase tests are under further consideration here. The “erythrocytic” formations, however, are not prominent in this biofilm extract development. The sample above subjected to UV radiation. The pink-magenta fluorescent hue is highly distinctive. This particular characteristic of the CDB, its association with the biofilm and the more advanced stages of CDB growth is an important subject that is deserving of additional research in its own right. The same tint has been observed on the skin surface as well as with dental observations. 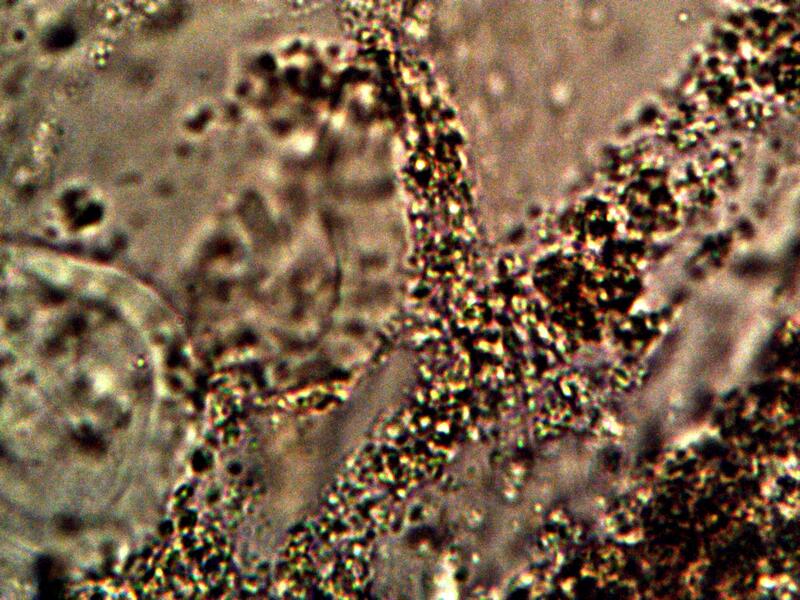 Microscopic examination of the biofilm extract. The existence of massive amounts of CDB within the extract are verified with this inspection. The biofilm extract is dominated by the presence of the CDB, and not the filament form. The filament form of growth is a more advanced stage of growth and occurs later in the development cycle of the organism. Magnification approx. 5000x. 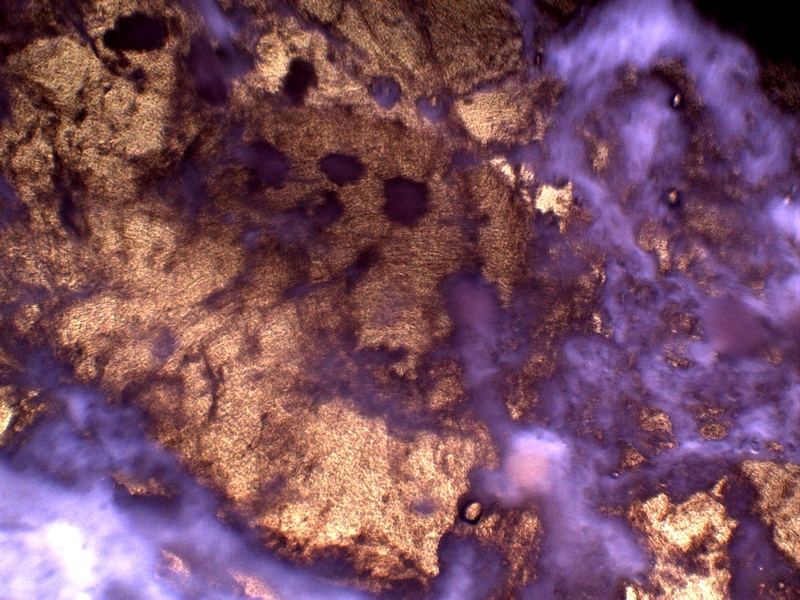 An additional microscopic view of the biofilm and excessive CDB existence within. Microscopic The presence of the co-linear arrangement of the CDB within a filament structure is also visible. The early stages of linear formation of CDB, also referred to as the ‘pleomorphic’ form’ are also occurring within this sample. The sample upon collection is primarily whitish in color as is shown above. Magnification approx. 5000x. 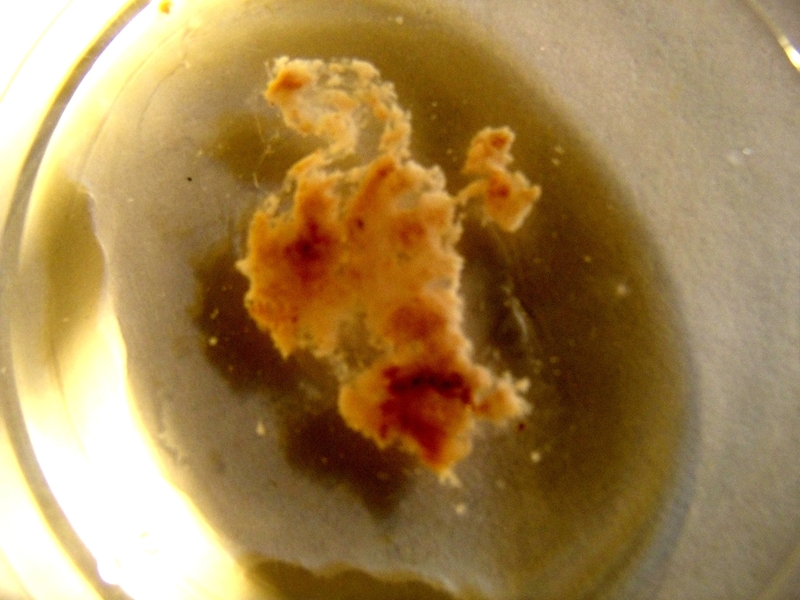 The filament form as it has developed from the biofilm extract and culture after approximately 2 weeks. This systematic development will be described in greater detail within a separate paper. Magnification approx. 5000x. 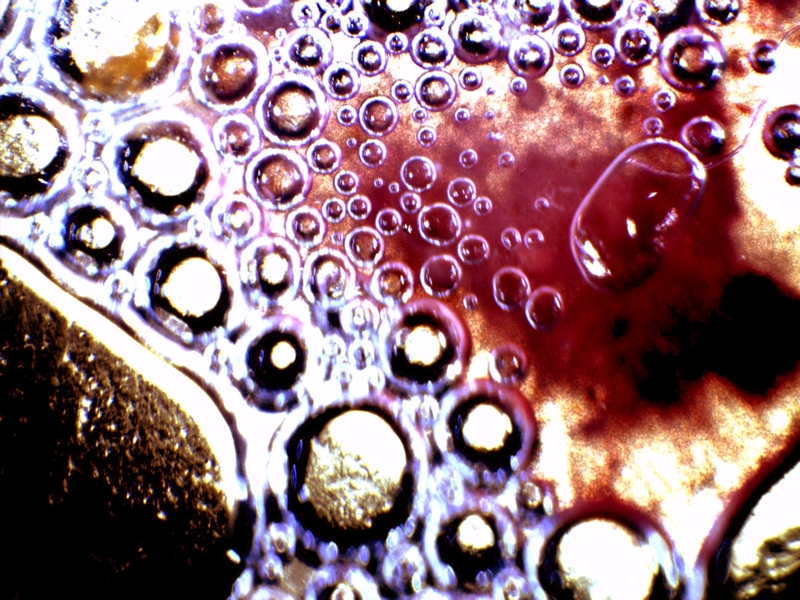 A microscopic image at the boundary of the reddish formation within the biofilm extract after a period of approximately 2 weeks. An extended filament network exists at this stage along with extensive rich color development. The variations of formation within the filament structures will also be discussed in greater detail within a separate paper. Magnification approx. 5000x. Readers may also wish to review a paper entitled “Growth Inhibition Achieved” (Jan 2014) that examines the role of ascorbic acid and various antioxidants in the culture growth process. Articles under this same topic exist several years prior to the current studies of antioxidants. In addition, the Morgellons : A Working Hypothesis (Neural, Thyroid, Liver, Oxygen, Protein and Iron Disruption) (Dec 2013) also extensively discuss the role of antioxidants within the studies of the growth process.